To aerate and over-seed your lawn, run the aerator over the lawn to open up the soil, fill a fertilizer spreader with grass seed, and run the spreader over the yard several times. 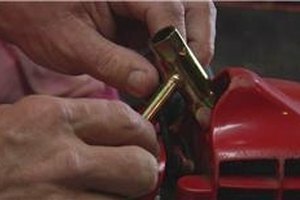 Run the wheels of a fertilizer spreader over the lawn to bed down the seeds before watering, and consider advice from a professional landscaper in this free video on gardening and lawn care. I'm Bill Elzey with Showplace Lawns. How to aerate and over seed your lawn. We'll start with aeration. 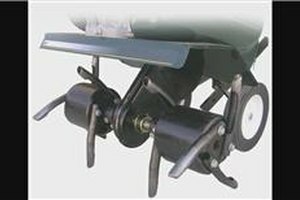 An aerator has a series of of spoons and as it rotates, punctures the soil a good aerator will also pull the plug what we call a plug, pull that out and lay it on top as a top as a top dressing. We always say that it looks like you have had a dog convention once we have aerated the lawn. Aerations are good in their own right for what they do. They open the soil up for proper drainage, they open the soil up for air flow in and out and through great disease preventer and also its name aerate gets the air to the roots which is where the grass breaths. In this particular case we are using the aerator to sort of open the soil up a little bit for a seed bed and especially during the Fall and this time of year in this part of the country where we put rye grass out for the Winter to run the aerator first across the lawn and then follow that with the rye seed. We put the seed out with a fertilizer spreader and we fill the bin on the fertilizer spreader and open it up and just make passes making sure to see where the seed fell so we can overlap it when we make our turns. Once we have done that a lot of times we will just walk all over where we have been and run the wheels of the fertilizer spreader over it to try to bed the seed down a little bit before turning the water on. This works fairly well and one other thing that you should do is cut the grass a little lower than normal at first, then aerate it and then put the seed out. This will accomplish the aeration and the over seeding of the lawn. Bill Elzey is the owner and manager of Showplace Lawns in Austin, Texas. Elzey has a Bachelor of Science in agriculture with course work in horticulture, soils, fertilizers, botany and entomology. He has more than 32 years of experience landscaping in South Central Texas. Showplace Lawns has been making Central Texas lawns greener than ever since 1992. Can You Put Down Grass Seed in Winter?